I can't find the book on Springer's homepage. Do I lack searching skills? While the book is still not available Tom English raises an eyebrow at Springer series editor Janusz Kacprzyk. along with famous ID people like William Dembski (The Design Inference and No Free Lunch), Michael Behe (Darwin�s Black Box and The Edge of Evolution), John Sanford (Genetic Entropy & the Mystery of the Genome) and Bruce Gordon (The Nature of �Nature). The proceedings of the conference will be published in 2012. Bob thought the conference was a grand success. Bob�s Ph.D. advisor, John Walkup, also came. John and his wife Pat are full time with Campus Crusade�s professor ministry in the Bay Area focusing on Stanford, Berkeley and San Jose State. Two of Bob�s graduate students, Winston Ewert and George Monta�ez, were also there so we got a wonderful three generation picture. On page 3 of the pdf you will find that picture of Marks, Walkup, Ewert and Monta�ez at the conference in front of some poster. and Winston were both very excited to meet him. David Berlinski (The Devil�s Delusion) and Steve Myer (Signature in the Cell) were also there. After the conference, Bob was interviewed by Berlinski�s daughter for the Ricochet blog. The interview is on YouTube. Wow, almost makes them seem human. Almost. And that's what they want you to think. A few years ago I was sucked into a conference run by the Discovery Institute. Some the ID people were sincere and perhaps naive. One had done their PhD at Cambridge, and another at Northwestern, under David Hull, my own mentor. I was a bit annoyed at finding I had been duped, but was pleased to renew friendships with Dan Brooks, Bob Ulanowicz, Bruce Weber and some others, as well as meeting Gunther Wagner and Steve Chaitin, and hearing Stuart Kauffman's confusion once again about spontaneous self-organization (Prigogine style self organizing systems) and movement to a minimal energy point. Michael Behe was there, and we talked. He is a nice guy, unlike the cads at the Discovery Institute. I had refereed a paper of his responding to criticism in Philosophy of Science. Since the criticism was both wrong and poorly argued, I thought he must have his say (as did the other reviewer, a prominent philosopher of biology whose name I am pledged not to reveal). A warning to those attacking ID: these people are much brighter than your garden variety creationists, and do be careful that you know what you are talking about, or else you guarantee them a refereed publication. In this case the original paper should never have been published. Behe conveniently missed my talk in which I mentioned recent work showed that rotary "motors" in bacteria resulted from just two mutations, contrary to Behe's argument that they are too complicated for evolution to produce. I also showed how Rosen's non-reducibility argument applied to the resulting network, which Chaiting remarked was the clearest expression of the idea he had seen. So the meeting was worthwhile. But I still resent being duped. Some time ago you reserved an electronic book review copy of "Biological Information: New Perspectives", 978-3-642-28453-3 for you. We are sorry to inform you that this book is not yet available online, but is being reserved for you. You will be informed by email as soon as online access is available. Clearly they haven't yet decided to ditch the book: my guess is that no decision has been made yet and this is just administrative. I wonder if Springer doesn't have access to Google. It seems quite likely that most of the volume's content has been published before. Thus, critical in depth reviews that are likely to cover most of each of its chapters are already available on the web. E.g., since the announcement of BI:NP Tom English pointed out the fallacy at the core of Dembski's and Marks' active information and Bob Lloyd shredded Sewell's second law musings. OTOH, Springer is currently experiencing what happens if they don't fulfill the demands of the DI and they may be afraid of additional censorship allegations however unsubstantiated they may be. I think that would be the job of reviewers, not Springer per se. But I'm sure they were careful about who they asked to review the book this time. 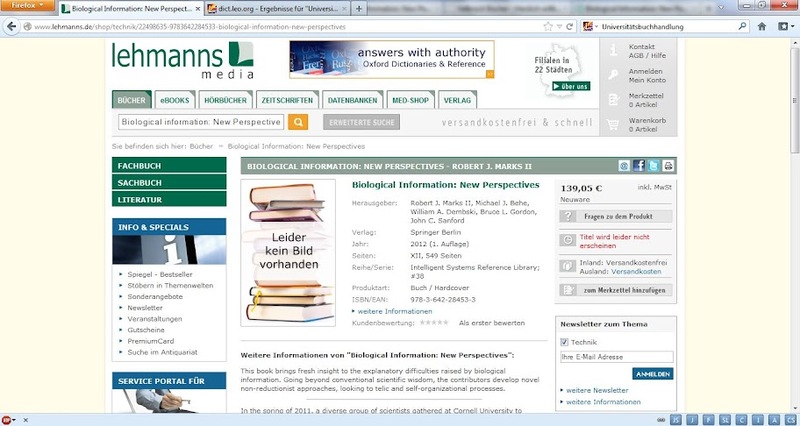 Today (here in Germany we have August 28 already) it is 150 days that BI:NP's scheduled publishing date passed. 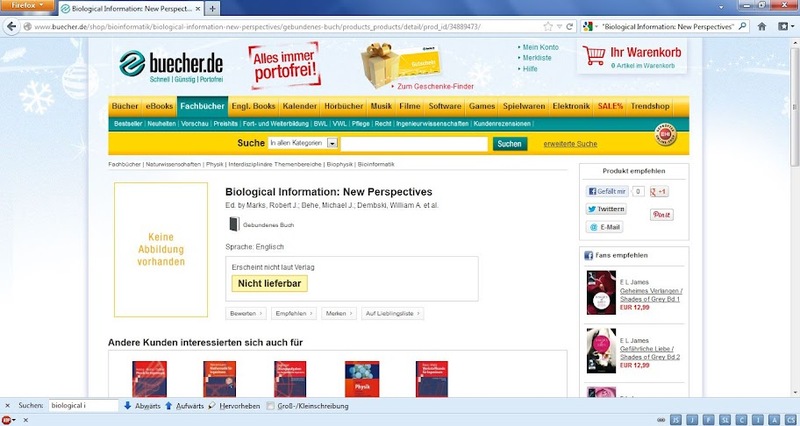 Limiting Google searches for �Biological Information: New Perspectives� to one week usually leaves us with links to a single web site, TrueFreethinker, which is one of the most bizarre pages �I have encountered. This week self-described Agentinean-American Messianic Jew Mariano Grinbank who was mentioned earlier in this thread posted about the devil and rock �music here and here. Granville Sewell takes scientific discussion to new heights: He has published a YouTube video in which he tells the sad story of "How the Scientific Consensus is Maintained". 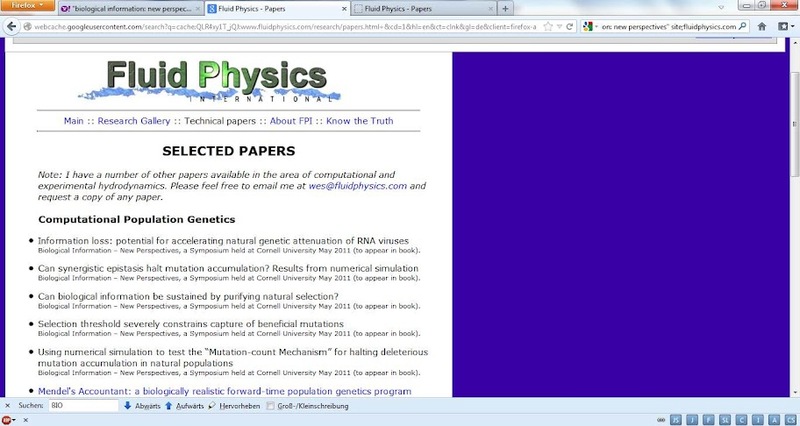 a 2011Cornell University symposium entitled Biological Information - New Perspectives. .
Then he whines about the Elsevier's Applied Mathematics Letters affair (mean David vun Kannon! waaah!) and the Springer affair. Next: Nasty Bob Lloyd attacked him in the Mathematical Intelligencer in March 2012, and Sewell's letter to the editor was rejected - unfair! Then, he boringly reads out that letter as published in EN&V. Last complaint: American Journal of Physics �rejected his paper, too; it's a conspiracy, surely? That's the content of 15 minutes of whining, comments are disabled, of course, as they are on UD where he announced the video. Thanks for the link and the summary. I don't have the nerve to listen to the whole thing. Over at The Skeptical Zone, there is a new post about the video. 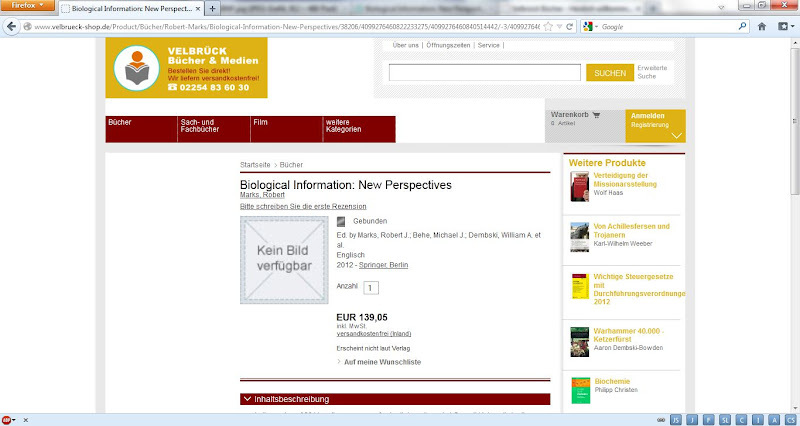 � Biological Information: New Perspectives (co-edited with Robert J. Marks II, John Sanford, Michael Behe, and Bruce Gordon). Under contract with Springer Verlag. According to Lehmanns BI:NP was planned as #38 of the Springer series Intelligent Systems Reference Library which is now occupied by the Handbook of Optimization. According to Amazon the later has already been published on August 19, 2012. And the Fourth Reich wins! At least if you believe the high thin whine of outraged incompetence. It was NOT "fraudulently misrepresented", you lying piece of recycled trash. Every title had been submitted to Springer months BEFORE the Symposium. This included authors, abstracts ... etc. Springer approved all materials submitted to them prior to the event and agreed to publish. What happened was something entirely different than your lying reporting. It is essentially another example of intellectual censorship based on religious ideology, not on science... another example of EXPELLED. I certainly am not expecting for you - sick carcass that you are - to comprehend nor accept any of this. In the spring of 2011, a diverse group of scientists gathered at Cornell University to discuss their research into the nature and origin of biological information. [�]Several clear themes emerged from these research papers: 1) Information is indispensable to our understanding of what life is. 2) Biological information is more than the material structures that embody it. 3) Conventional chemical and evolutionary mechanisms seem insufficient to fully explain the labyrinth of information that is life. There you are, you know more about the proceedings than those who demanded it the publisher withdraw the book in March. I haven't looked at TWeb for some time, but IIRC, Jorge is permanently irate. Jorge is an anagram for r JoeG. Any similarities in style? Dembski still hasn't produced the book he was supposed to write to fulfill his Templeton grant obligation from 12 years ago. ETA: He presently lists Being as Communion as "long overdue" on his CV. So his parents grounded him? sparc, thanks for the updates. It appears that Springer isn't going to publish BI:NP. The IDiots are probably looking for another publisher, and I can't help but wonder if they're considering or planning a lawsuit against Springer. Even if they have no chance of winning such a suit they might push it anyway just to get as much 'Expelled' publicity as they can milk from it. Jorge once said his eyes were opened by Kent Hovind videos - and he's a fundigelical Christian. Even if they have no chance of winning such a suit they might push it anyway just to get as much 'Expelled' publicity as they can milk from it. If only the movie had been called "Expressed" there'd have been a pun in there somewhere.